Even though everyone is talking about it, there is no concept in business today more muddled than 'strategy'. Richard Rumelt, described by McKinsey Quarterly as 'a giant in the field of strategy' and 'strategy's strategist', tackles this problem head-on in a jargon-free explanation of how to develop and take action on strategy, in business, politics and beyond.Rumelt dispels popular misconceptions about strategy - such as confusing it with ambitions, visions or financial goals - by very practically showing that a good strategy focuses on the challenges a business faces, and providing an insightful new approach for overcoming them. His sharp analysis and his brilliant, bold style make his book stand out from its competitors (something that Rumelt himself says is crucial).Rumelt has always challenged dominant thinking, ever since, in 1972, he was the first person to uncover a statistical link between corporate strategy and profitability - and this is his long-awaited tour de force. 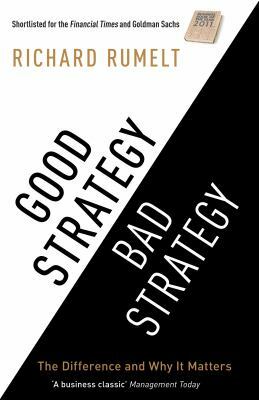 'This is the first book on strategy I have read that I have found difficult to put down.' - John Kay, London Business School.